New York Public Radio (NYPR), which contains WNYC, the nation’s most listened-to public radio station, and WNYC Studios, the fifth largest podcast producer in the world (you may be familiar with one of their shows: Freakonomics Radio, RadioLab, 2 Dope Queens, The New Yorker Radio Hour, among others), reaches nearly 30 million per month. As a nonprofit organization, NYPR has traditionally used data to convert listeners into donors. Nate Landau, Chief Digital Officer at NYPR, spoke at our most recent on how the organization is expanding their usage of data to grow, know, and engage their audience. Nate began his talk by speaking to how little actionable data exists within the podcasting arena. In radio, Nielsen ratings, which are released 30 days after air, allow a station to compare to other stations. In podcasting, the industry segmentation across platforms prohibits the existence of any comprehensive data. To overcome this obstacle, NYPR made the decision to design their own data strategy. 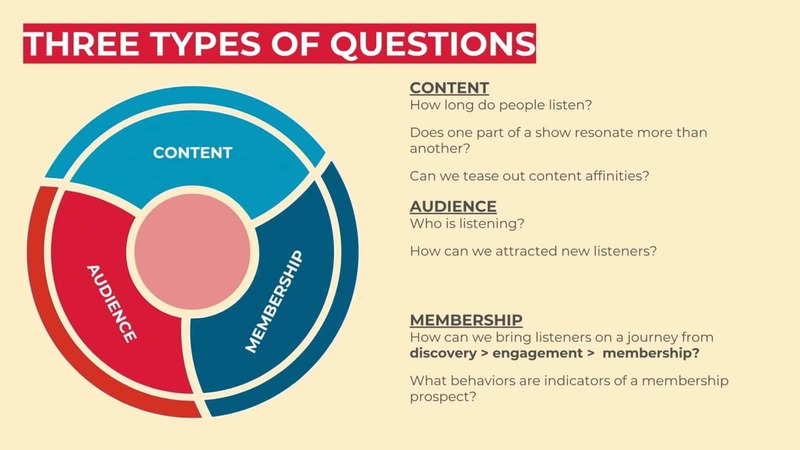 Nate presented three types of questions that NYPR uses to guide their data strategy – Content, Audience, and Membership. NYPR begin building their own internal capabilities to understand their audience – both who they are and how they are listening to content. To address these challenges, NYPR began building the first data warehouse in public radio– a tool to normalize all of the available data, as well as provide a platform where the rest of the organization could access and engage with the data to make informed, strategic decisions in their respective departments. This effort is relatively new for NYPR, so Nate’s team is still seeking buy-in from individuals within the organization. Yet, that hasn’t stalled the initiative’s growth. NYPR plans to collect additional types of data in the future and is currently rolling out their datasets and engineering knowledge to other public radio stations across the country. Our “Data + the Greater Good” Meetup series has featured speakers from an array of nonprofit organizations, including The Met, The Whitney, Lincoln Center, and Cooper Hewitt, Smithsonian Design Museum. Read about their presentations on our blog.